Wednesday February 20th 1878 Hattie washed again this morning and I cleaned up the house. Mother went to town in the afternoon. I was at work on my tidy. A year ago tonight we went over to McCalls to a party. It is thirty three years today since Mother and Father were married. Thursday February 21st 1878 I baked cake and helped do the ironing before dinner. It rained all day. I put in my spare time on my tidy. I read awhile in the evening finishing up a book I borrowed of Bird. 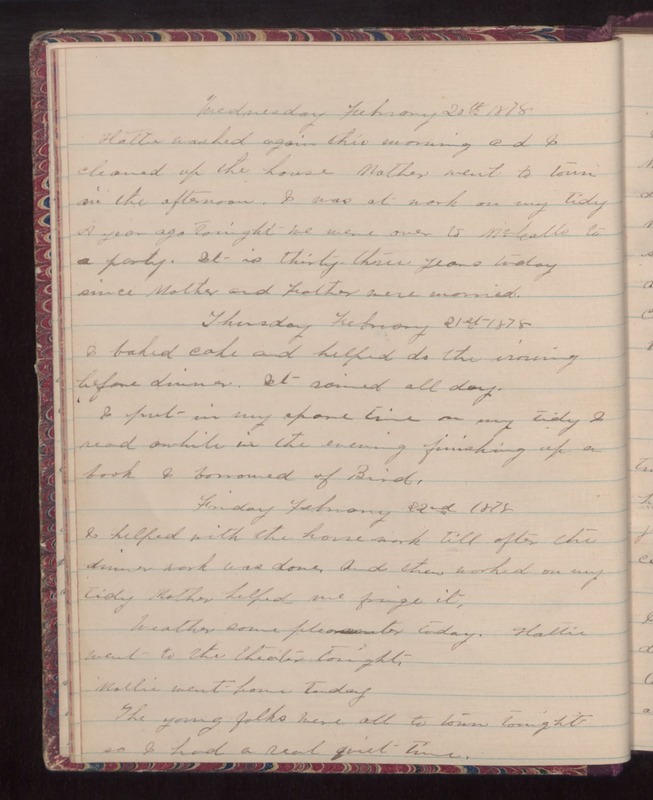 Friday February 22nd 1878 I helped with the house work till after the dinner work was done and then worked on my tidy. Mother helped me fringe it. Weather some pleasanter today. Hattie went to the theater tonight. Mollie went home today. The young folks were all to town tonight so I had a real quiet time.